Do you know how powerful pomegranates are? Pomegranates are a rich source of vitamin C, vitamin E, vitamin K, antioxidants, folate, potassium, fiber, and have anti-inflammatory properties. More than that, studies show eating pomegranates or drinking the juice, can help protect against many diseases (even cancer). Pomegranates are packed with antioxidants. Filled with their juicy seed sacs called arils, pomegranates contain three times the antioxidant polyphenols, including tannins, anthocyanins, and ellagic acid. These polyphenols are what give pomegranate seeds their vibrant red colour. When it comes to juice in particular, pomegranate juice contains the highest level of antioxidants than most fruit juices and has three times more antioxidants than red wine and green tea. The antioxidants in pomegranate juice can help remove free radicals and protect cells from damage. The antioxidants in the juice and their high concentration are also believed to stall the progress of Alzheimer’s disease and protect memory. • Pomegranates help with infections, depression and menopausal symptoms. • Pomegranates help with aging as they provide youthful, glowing skin. • Pomegranates have antibacterial and antiviral properties which reduce the effects of dental plaque and protect against oral diseases. • According to several studies, drinking eight ounces of pomegranate juice daily can improve learning and memory. • The juice of a single pomegranate has more than 40 percent of the daily requirement of vitamin C.
• Pomegranates reduce inflammation in the gut and improve digestion. • Pomegranates supply iron to the blood and reduce symptoms of anemia like exhaustion, dizziness, weakness and hearing loss. • Eating pomegranates reduces the possibility of having premature babies and avoiding low birth weight in infants. Infections: According to a study cited in the National Institutes of Health, patients who were given pomegranate juice three times a week for a year had fewer hospitalizations for infections and fewer signs of inflammation, compared with patients who got the placebo. Memory: A study conducted by Dr. Susan Bookheimer et al., University of California, Los Angeles, suggested a role of pomegranate in enhancing memory function in middle-aged and older adults with mild memory complaints. Pomegranates also reduce the possibility of developing Alzheimer’s disease among older generations. Diabetes: A Technion-Israel Institute of Technology study showed that the antioxidants found in pomegranate juice may be especially beneficial to diabetes patients. Researchers found that drinking pomegranate juice reduced the uptake of oxidized “bad” LDL cholesterol by immune cells, which is a major contributing factor to atherosclerosis. Heart Problems: The antioxidants in pomegranates benefit the heart in many ways, including lowering systolic blood pressure, slowing (and even reversing) the growth of plaque formation in the arteries, improving blood flow, and keeping arteries from becoming thick and stiff. According to a study published in the Proceedings of the National Academy of Sciences, mice that drank pomegranate juice reduced the progression of atherosclerosis by at least 30 percent. Heart Health: According to research published in the American Journal of Clinical Nutrition, pomegranates prevent the oxidization of “bad” LDL cholesterol in the body. Regular intake of pomegranate juice maintains a good flow of blood in the body and decreases the risk of heart attack and stroke. The antioxidant components in this fruit help keep bad cholesterol from accumulating, and thus, keep the arteries clear of any clots. These clots are clear because pomegranates have the ability to make blood thinner. Osteoarthritis: A study by Dr. Syed Ahmed, Division of Rheumatic Diseases, Case Western University, Cleveland, USA, revealed that the anti-inflammatory effects of pomegranate may inhibit cartilage degradation in osteoarthritis. Pomegranates help reduce many illnesses, including atherosclerosis and osteoarthritis, so the damage caused due to thickening and hardening of the arterial walls, the cartilage and joints, can be cured by eating these fruits. 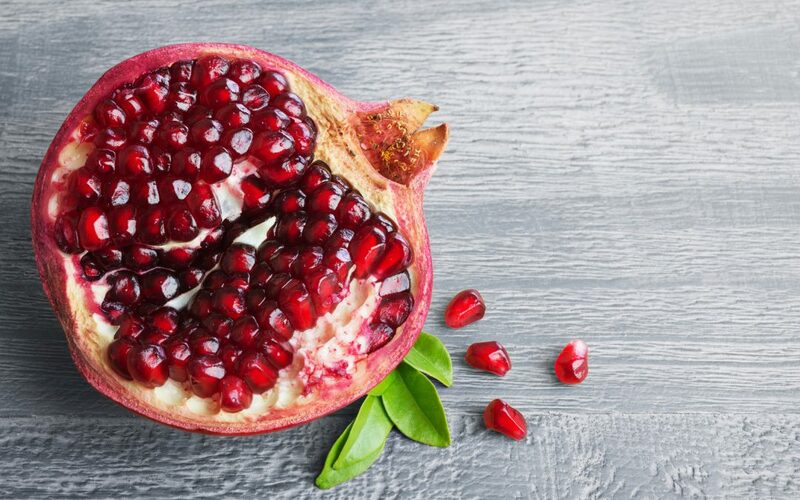 Also, pomegranates are capable of preventing the creation of enzymes that are responsible for the breakdown of connective tissues within the body. Cancer: According to the American Cancer Society, through research, regular consumption of pomegranates can reduce the PSA levels in the body and aid in the fight against existing cancer cells. Studies suggest the anticancer properties of pomegranate may help prevent the spread of cancer and also induce apoptosis. A separate study suggests that pomegranate seed oil is rich in compounds that have antioxidant and anti-inflammatory potential and may inhibit viability of breast cancer cells. According to the University of Maryland Medical Center, pomegranates antioxidant activity is known to inhibit cell proliferation, invasion, and promote apoptosis (cell death) in various cancer cells. In one study, pomegranate extract was found to inhibit the growth of human breast cancer cells by inducing cell death. Erectile Dysfunction: Research led by Kazem Azadzoi of Boston Veterans Affairs Medical Center, Massachusetts (Journal of Urology), stated that pomegranate juice can be very helpful in curing erectile dysfunctions based on animal studies. Researchers from the University of California and Beverly Hills also found that pomegranate juice improved erectile dysfunctions in a sample test conducted on 61 men. To see immense health benefits, add pomegranates to your daily diet. If you’d like to sip on pomegranate juice, make sure you look at the label to ensure that it is 100 percent pure pomegranate juice without added sugar (or juice it fresh). *Disclaimer: Before adding anything new to your diet, always speak to your health practitioner.